As leaders we identify young people in our children’s and youth ministry and we want to invest in them. When we catch up with them we call it discipleship (and it is!). The trouble is, that in some people’s eyes that person is a disciple and they are a Christian. 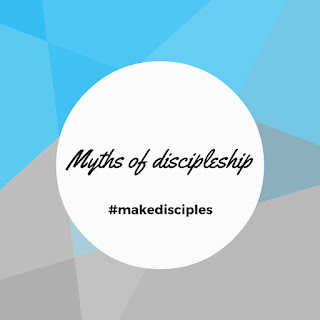 They see a disciple as, someone who is really committed to making disciples or as a person who might go to Bible college and become a minister or missionary. The problem is that suggests that there are two levels of Christians. There are Christians and there are disciples. Christians are your average person who trust in Jesus’ death and resurrection and the disciple is a super charged version. We need to be reinforcing to our people if you are a Christian, you are a disciple and a disciple maker. The notion that there is a dichotomy between a 'Christian' and a 'disciple' is indeed prevalent within Western Christianity today. It is, obviously, a false dichotomy; one that has dangerous consequences in insidiously massaging individuals into states of lukewarmness. The word 'disciple' now seems to have the connotation of 'acolyte' or 'apostolic disciple'; as something not common and thus not applicable to this time (unless of course you desire to enter ministry). On the other hand the term 'Christian' is becoming characterised as a label resting in self-affirmation of identity in the faith, with less emphasis placed on obedience or a changed life. This is not to say that all adhere to such understandings, but it is not uncommon. The Scriptures make it clear that all Christians are disciples, and ergo must themselves make disciples, witness for Christ where He places them, and seek to live a life that brings glory to God in obedience. It is imperative that all Christians in leadership positions, whether bishops, pastors, youth ministers, Bible leaders and church workers, actively work to, through the power of the Holy Spirit, shift the congregational and group cultures of Christian people out from the splendid isolationist passivity to one of making 'disciples of all nations, baptising them in the name of the Father and of the Son and of the Holy Spirit, and teaching them to obey everything I [Christ] have commanded'. I especially agree with your observation that this false dichotomy causes lukewarmness.